Marjie Kemper here, happy to share an art journal page I made using Faber Castell's gelatos. I picked up a lot of tips taking classes with Donna Downey last weekend, and now I can't seem to pry the gelatos out of my hands! All the colors are so rich and creamy, and the appearance can range from brilliant to muted depending on how you apply them. This page is made with small shipping tags painted with gesso, then colored with gelatos. I used two blues, a yellow, and black, rubbing the color into the tags with my fingers. You get different effects rubbing with a dry finger or when using water (just lightly wet your fingers) so feel free to experiment to find the style you like. I took two extra tags, treated them the same way with gesso and gelatos, then stamped with the Market Street tiny alpha background stamp and Cobalt archival ink. I like the look of the stamped tags on top of the plain tag background. I used some favorite Stencil Girl stencils for the starbursts and the number border from the new Balzer Designs Tickets stamp set. The DREAM letter stamps and fountain pen are oldies from my stash, stamped with Jet Black Staz-On. 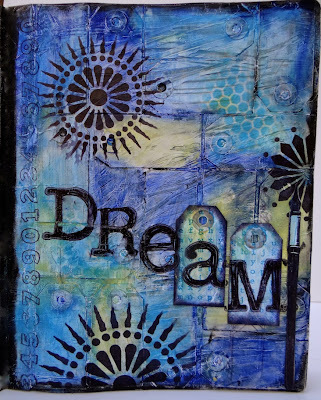 So grab your journal and have a play with gesso and gelatos. Kim has them in every color possible! Gorgeous, Marjie. I love the boldness of the black against the blues. I haven't played with gelatos, but they look wonderful. Beautiful Marjie! I love the tags covered with the text type and the black against the blue is stunning! Hi Alison, I've just been browsing your blog! Gorgeous creations! Love the texture and color caught in all the texture! This looks wonderful Marjie. The blues against the black stencilling make the whole thing glow with light! A stunning journal page. I've not seen gelatos here either but I did find some children's soluble wax crayons which are surprisingly good! Marjie..this is delicious. Deep colors, textures are perfect..what else could you ask for? I've been using Gelatos for almost a year and I LOVE them for so many reasons. They are wonderful for mixed media, art journaling, card making, stamping, you can do so much with these great little color sticks! You can buy them online if you can't find them locally. That's what I did. Beautiful page Marjie, love the way you used the colors and the tags! This is gorgeous! I love the blues. Oh how wonderful! I would love to get some of these gelatos! They look like they are great! !